This year, I taught solving absolute value equations for the first time ever. They weren't included in Oklahoma's old standards for Algebra 1 or Algebra 2, so I didn't cover them. I felt a tiny bit guilty about not teaching them because I knew my students would be seeing them on the ACT test. Oklahoma has now rewritten our standards to align more closely with the ACT, so now I have to teach them. I've been nervous about teaching them, but I think it ended up going really well. My Algebra 1 students are currently claiming that this is the EASIEST thing we've done all year. I would disagree with that, but I have heard student after student share that sentiment. Of course, a lot of that is probably due to the fact that I gave them word problems for every single equation and inequality we've solved this year. Yes, I'm that mean teacher who is making them write their own equations or inequalities before they get to solve them. It's actually been a really awesome experience doing it this way, but it's taken sooooooooooooooooooooo long. I'm ready to get done with our solving equations unit and move on to something else!!! So, I decided to forego the word problems and just give them some context-less absolute value equations to solve. Hopefully, I'll be able to fine-tune this next year and incorporate some word problems for absolute value equations, too. I was very proud of myself for not telling my students how to solve this type of equation, Instead, I simply asked them to remind me what absolute value means. After a student reminded the class that absolute value is the distance a number is away from zero, the class was quickly calling out answers. "Three!" Then, another student chimed in "It could be negative three, too!" So, we discussed it. Which numbers have a distance from zero of 3? 3 and -3. So, we wrote x = 3 in one box and x = -3 in the next box. There was debate about which number should be placed in which box. I told them it didn't matter as long as they put the numbers in the correct order on the number line. We made our lazy number lines that only contain the most important numbers for the problem, 3 and -3. Soon, a student was suggesting that we put closed circles on the 3 and -3. Some students were confused about how we knew they would be closed circles. At first, I was confused about why they would be confused. 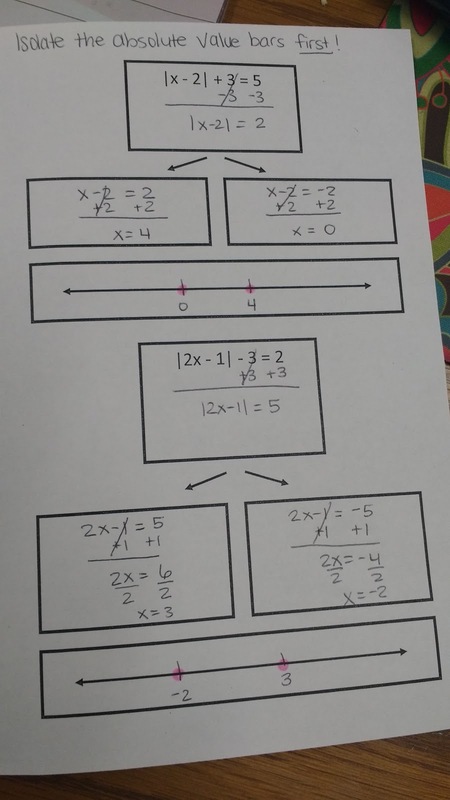 Then, I realized that the only time I had required my students to use a number line so far was when we were doing inequalities. This was an equation, and we hadn't discussed how to graph solutions to an equation on a number line yet. A couple of students suggested that we should shade in between the -3 and 3, but other students chimed in with why that would be inappropriate. I really didn't have to do much teaching at all during this lesson because my students were doing almost all the work! And, they did need a bit of help to get started. 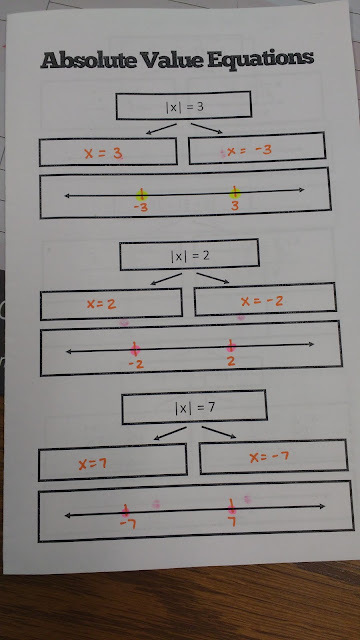 A student was able to tell us that the answers were 3 and -1 to the equation |x - 1| = 2, but we needed a way to be able to solve the equation if we couldn't see right away what the answers were. I wrote |x - 1| = 2 on the dry erase board (my projector for my SMARTboard decided to die the other day and fill the room with smoke...) and covered the x - 1 part up with my hand. I asked the class what the thing hiding under my had had to equal. In each class, someone realized that what was under my hand had to equal either +2 or -2. So, that gave us our two equations to solve. The last two problems I gave my students required them to isolate the absolute value bars FIRST. I had planned on this lesson taking the entire fifty-minute period. But, all of my classes (except one large class that struggles to stay quiet and on task) finished it in 20-25 minutes! Want the file I created? I uploaded it as an editable Publisher file and a non-editable PDF file here! You're a LIFE saver! Or at least a LESSON PLAN saver! 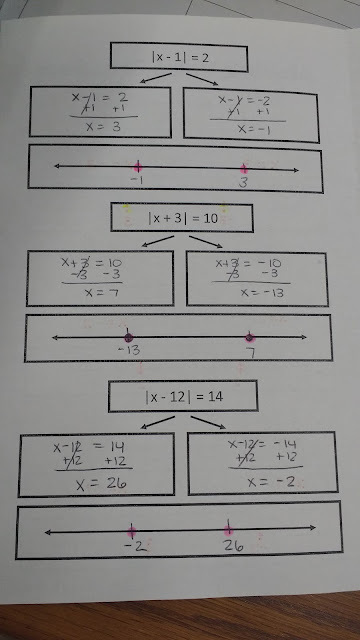 I just went through inequalities with my algebra 1 students and was concerned with how I was going to deal with absolute values given that all 3 of my classes are slow to the grasping, but this looks perfect! Thank you so much for sharing! I was supposed to share my stuff with you two months ago and it got pushed to the back burner and then forgotten. For that I'm sorry. Kind of. I like what you came up with so much better than what I have. I will be saving. And thanks again for sharing. I want to do the same, but I just haven't figured out how to discipline myself to take the time to do it on a regular basis. Great post. I really like the discussion about the closed circle and how students related that to graphing inequalities on a number line. If I could suggest two things: have student label "zero" on the number line (as a reference point) and have students show their work after finding the solutions. 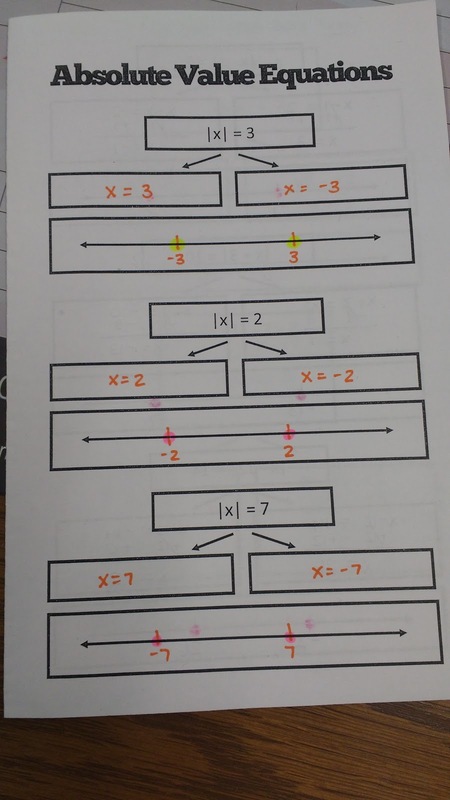 After the number line, there could be a "Check Your Solutions" or "Show Your Work" section. Great graphic organizer. I will definitely use it. Definitely agree that a "Check Your Solutions" section would be helpful! This is a great example of how letting students grapple with something unfamiliar can be a powerful teaching technique. You are too modest in saying that you didn’t have to do much teaching for this lesson! 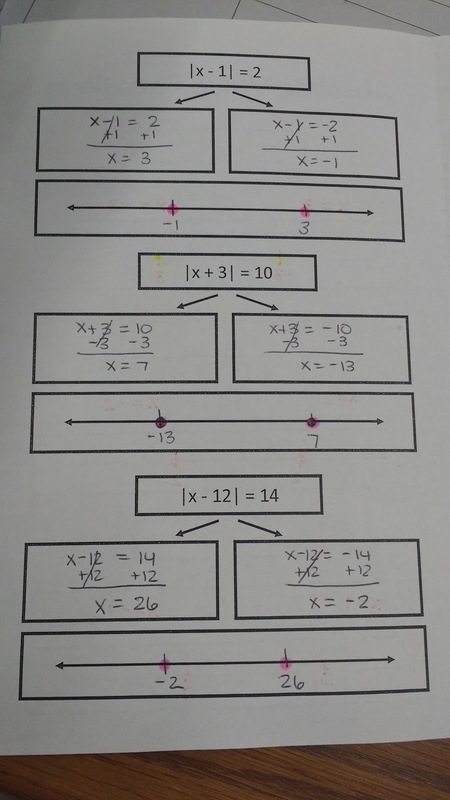 Really, you set your students up for success by developing proficiency with equation and inequalities before asking them to take on absolute value equations. Excellent scaffolding and your graphic organizer is a great problem-solving tool! Thanks for sharing. These are super helpful! How did you address "no solution" problems though (when the absolute value is equal to a negative number)? Did that come up in a different lesson? Worked great! You are amazing! I appreciate your willingness to share. I'm working on new curriculum materials for my district's high school Math 3 course and this will be super helpful to include in our interactive toolkit resources. You are always so good to share your note/foldable pages! THANK YOU!! I appreciate your talent and hard work--great helps! !